Daniel Dondanville, the sixth child and youngest son of Ludwig Dontenville and Clara Brumt, was born in St. Maurice, Alsace on July 15, 1849. His babtismal name was Donat. He was six months old when he came to the United States with his parents. As a young man he worked on the farm his father established. On May 6, 1873 Daniel married Mary Ellen De Bolt, daughter of prominent early Serena Township residents. They resided on the family farm in Section 13 of Serena Township for many years following Ludwig's death. In 1888 they constructed their own home on the property which still stands. Nine children were born to their marriage: John Franklin, 1874; twins Nellie Mae and Ellie Rae, 1875; Raymond Daniel, 1877; Lyda Jane, 1882; Floyd Merrelle, 1883; Elizabeth Jeanette, 1885; Florence Clara, 1887; and LaVern George, 1892. As the older boys left home Daniel sold the farm and moved to Sheridan Illinois where he worked as a carpenter and the younger daughters attended high school. Attracted by the opportunities that pending Statehood presented for Oklahoma in early 1906, Daniel applied for and was granted a real estate permit to sell land in the Oklahoma Territory. In 1907, he bought a farm about nine miles from Blackwell Oklahoma. Mary Ellen and Daniel moved to Oklahoma with the youngest of their children, Florence and LaVern. They lived for a short time in Blackwell while a new home was being constructed on the farm. Eventually Lyda and Elizabeth, who had been teaching in Illinois, followed. Life in Oklahoma was not easy. Mary Ellen wrote to her children in Illinois complaining first about the dust, then about the rain, and always about the bugs. In 1911, land was opened for homesteading in northwestern Montana. In February of that year Lyda and her husband Jack Bras, encouraged by Jack's brother, moved to Montana. In April Daniel sold the farm in Oklahoma and the rest of the family followed. 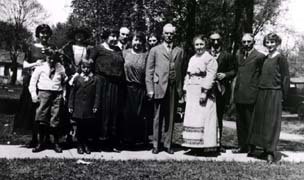 All of the children, with the exception of LaVern who was not yet 21, were granted homesteads at Lonepine, on the Flathead Indian Reservation, in the Little Bitterroot Valley. Because the grants at that time were only 40 acres each they claimed adjacent sections so they could build their initial tar paper covered shacks at the point where four properties came together. During their remaining years Daniel and Mary Ellen divided their time between Montana and Illinois with Mary Ellen spending much of her time at the home of her daughter Ellie Rae Fread in Ottawa. . Mary Ellen died at their home in Lonepine, Montana on June 11, 1934. Daniel died in Montana July 28, 1936. Both are buried in the Ottawa Avenue Cemetery in Ottawa, Illinois.